As soon as I saw this one up for grabs on Edelweiss, I knew I *had* to read it. A creepy middle-grade story featuring ghosts, dark wizards, magic and mystery sounds like perfection to me! PLUS, it's a standalone and we all know how rare those are! Sometimes you just need a nice middle-grade read to sweep you away and take you for a ride. 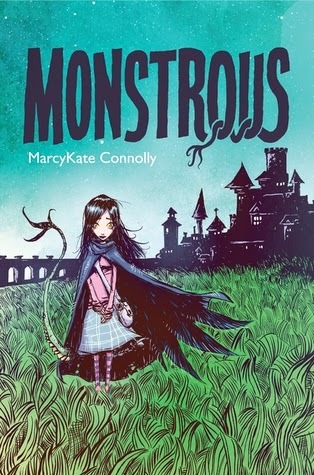 I'm hoping Monstrous proves to be as entertaining as it sounds :) And who could resist that cover anyway?! Gorgeous! Let me know when you link me up! I hope you get it soon and enjoy it! I think I saw this on another WoW and it piqued my interest then too. Looks like a deliciously dark yet somewhat whimsical MG tale, hope you enjoy! Oh I know, how can you not love this cover?! I love how the S in the title is elongated into a spiky tail as well. This one seems totally up my alley as well - I love when MG reads are a bit darker, more mature and less fluffy. I almost picked this one, too! I was attracted to the cover because it looks a bit manga-like. I'm not usually a middle-grade book person but I make exceptions for the creepy ones ^^ Great pick, hun! I think I'm in love just because of the cover too! This might be a fun one to read with my kiddos. I love finding great MG books to read, not only for myself but also for my son. This sounds like one that we could both enjoy. I'll be on the look-out for your review when this one is out. Thanks so much for sharing :D Jaclyn @ JC's Book Haven.